Western blot analysis of extracts from HeLa, 3T3, and COS-7 cell lines using B-Raf (D9T6S) Rabbit mAb (Biotinylated). 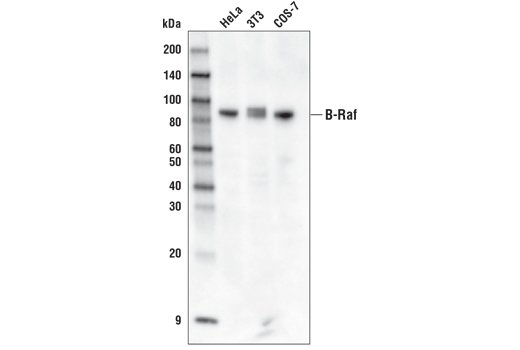 B-Raf (D9T6S) Rabbit mAb (Biotinylated) recognizes endogenous levels of total B-Raf protein. Monoclonal antibody is produced by immunizing animals with recombinant protein specific to the amino terminus of human B-Raf protein. This Cell Signaling Technology antibody is conjugated to biotin under optimal conditions. The biotinylated antibody is expected to exhibit the same species cross-reactivity as the unconjugated B-Raf (D9T6S) Rabbit mAb #14814. A-Raf, B-Raf, and c-Raf (Raf-1) are the main effectors recruited by GTP-bound Ras to activate the MEK-MAP kinase pathway (1). Activation of c-Raf is the best understood and involves phosphorylation at multiple activating sites including Ser338, Tyr341, Thr491, Ser494, Ser497, and Ser499 (2). p21-activated protein kinase (PAK) has been shown to phosphorylate c-Raf at Ser338, and the Src family phosphorylates Tyr341 to induce c-Raf activity (3,4). Ser338 of c-Raf corresponds to similar sites in A-Raf (Ser299) and B-Raf (Ser445), although this site is constitutively phosphorylated in B-Raf (5). Inhibitory 14-3-3 binding sites on c-Raf (Ser259 and Ser621) can be phosphorylated by Akt and AMPK, respectively (6,7). While A-Raf, B-Raf, and c-Raf are similar in sequence and function, differential regulation has been observed (8). Of particular interest, B-Raf contains three consensus Akt phosphorylation sites (Ser364, Ser428, and Thr439) and lacks a site equivalent to Tyr341 of c-Raf (8,9). Research studies have shown that the B-Raf mutation V600E results in elevated kinase activity and is commonly found in malignant melanoma (10). Six residues of c-Raf (Ser29, Ser43, Ser289, Ser296, Ser301, and Ser642) become hyperphosphorylated in a manner consistent with c-Raf inactivation. The hyperphosphorylation of these six sites is dependent on downstream MEK signaling and renders c-Raf unresponsive to subsequent activation events (11). Avruch, J. et al. (1994) Trends Biochem Sci 19, 279-83. Chong, H. et al. (2001) EMBO J 20, 3716-27. King, A.J. et al. (1998) Nature 396, 180-3. Fabian, J.R. et al. (1993) Mol Cell Biol 13, 7170-9. Mason, C.S. et al. (1999) EMBO J 18, 2137-48. Sprenkle, A.B. et al. (1997) FEBS Lett 403, 254-8. Marais, R. et al. (1997) J Biol Chem 272, 4378-83. Guan, K.L. et al. (2000) J Biol Chem 275, 27354-9. Davies, H. et al. (2002) Nature 417, 949-54. Dougherty, M.K. et al. (2005) Mol Cell 17, 215-24.